There will be a service at RAF Wratting Common memorial on Sunday May 29th 2016 at 12 noon. The Cadets from Haverhill will be on Parade. All are welcome to attend. 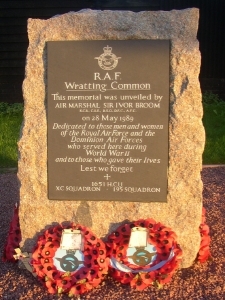 Wratting Common, in Cambridgeshire, was an RAF Bomber Command airfield during World War 2. This website is an attempt to collect together as much information, photographs (old and new), documents, plans etc. relating to RAF Wratting Common in a single place on the internet. It is hoped this will serve as a online memory to the service men and women who were based here, and especially of the 260 who lost their lives. Much of the material presented here was provided by Ron Pearson. Ron was one of the Trustees of the RAF Wratting Common Memorial Trust, which was set up to create the permanent memorial to the airfield that was unveiled in 1989 at the site of the former entrance at Weston Woods farm. Ron collected many photographs and other information about the airfield, and without his help and material this site would not have been possible. Ron is the Standard Bearer for the Bomber Command Association.